I am usually hesitant in delving into Nigerian national issues for reasons quite official. I am however constrained by the recent happenings in my own dear Abia state to ask what may appear to be a bordering question (s) because injustice to one is injustice to all. To start with, who exactly has crossed "our" national and ethnic red lines and further threatened "our" so-called "national security and unity? ", a slogan which constantly points to an unforgivable British mistake of all time. While still struggling to recover from the shock of the wanton killings orchestrated by bloodsucking, trigger-happy military men of operation python dance team posted to Abia state for the purposes of decimating the entire region, the so-called Eastern governors rose from their ill-advised meeting and dashed all the hope that someone values the lives of our youths of the region. What a shattering shame of the century! The governors we thought were our own, rose from a joint meeting with no condemnation of the indignity of human person unleashed on their people , including abducting a custodian of his people's values-His Royal Highness, Eze Kanu, inhumanity, intimidation, marginalisation and unjustifiable unscrupulously massive murdering of their unarmed, helpless , jobless and innocent youths. They, with the shame of discovering the disappointment of the people over their conducts and failure, unguardedly pronounced the activities of IPOB inconsequential and at the same time demanded that the same people who they have failed to protect and deliver democratic dividends should report their grievances through their disgraceful Governors' forum. What a contradiction! They had no dexterity to demand national apology and redress for even those innocent women and children targetedly murdered, wounded and those hit by stray bullets including an innocent mad woman battling with the horrors of her life. The unbearable and undesirable pain and loss caused to its citizens meant nothing to them at all, after all, their families are abroad dwelling safely. Those elected to lead us made no mention of the massive destruction and inhumanity meted to their own people whom they swore to protect. This is totally demoralizing, discouraging and battering. What other empirical evidence is required to know that these Governors do not value life as much as any right-thinking conscience driven rational human being should. Life must be held sacred and sacrosanct by all even as our different religions and belief support the sacredness and value of life. Tearfully, I, want to seize this opportunity via this medium to say that my thoughts align with the entire Igbo ethnicity, that Chiukwu Okike, the creator in Heaven will grant every mourner the fortitude to bear these irreparable and undesirable inhumanity, the indignity of the human person and multitudinous losses of diverse dimensions. Regrettably, these governors did what majority of the people envisioned because over years they seemed not to be brave enough to advance the development of the "Southeast"; they lack the political will to really make effective and judicious use of resources at their disposal to ensure that their people have an appreciable replica of ease of life enjoyed by others in other regions. Instead, we have hungry and sympathy-bereft, solipsistic politicians selected by their dubious predecessors to foist wickedness on the inhabitants of their region. It must not be forgotten that these youths who suffer now are the same people that assisted these insensitive and reckless politicians in gaining power. Now, what is going on?These governors have assumed a revered level of omnipotence because of their power of reckless use of state resources funnelled into 'self- poverty alleviation' schemes extended to family and cronies. No one demands accountability anymore. 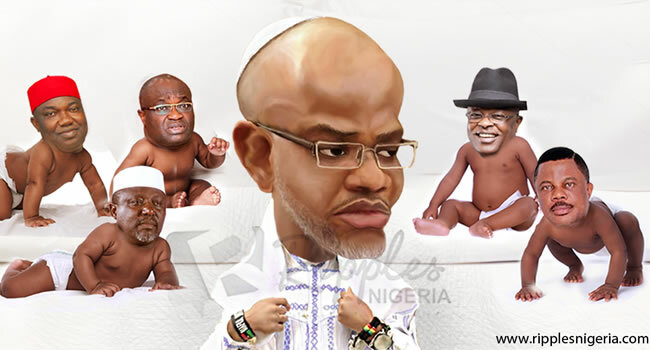 The governors simply danced naked in Enugu because of their personal agenda - to asphyxiate the perceived dangerous gusto with which IPOB and her sympathisers adopted in championing their course - which is seriously threatened by the ever-increasing political and ideological awareness encapsulating both young and old in the Southeast, thus, endangering their guber ambitions come 2019. The so-called meeting in Enugu passed one simple message to everyone including the entire world that the electorates do not count at all and the lives of the electorates are of no value by their own personal standards. What a sad, but a remarkable day! In the wake of the increased but impressively sustained tempo of the Biafran peaceful struggle, some group of persons saw an opportunity to meet out vendetta. A quick reminder: 97% and 5% was nerve-twisting and absolutely denigrating analogy so handy for a man who called himself a president used to distinguish between politically favoured and politically hated people. The body language and administrative activities of the president explicitly toll the path of his irrational analogy and still, nothing can dissuade him from sustaining his fixated push to fulfil his wish and that of his cohorts. Well, "Nigerians" deserve what they get because it has always been obvious that the stock of politicians in Nigeria has expired, yet, Nigerians have been conditioned to believe that "our" journey to greatness can be driven by retired military officers turned "democrats". Nobody was able to see this coming, but my prognostications were absolutely correct. It should always be remembered that the biggest failure of the so-called Nigeria, is the lack of respect for human lives and security. A state where the military, which ordinarily should be the pride of her citizens seizes sophisticated weapons and metes deaths on hapless citizens in the disguise of a military operation. A state where the lives of the electorates mean nothing to the elected. The truth which we have all failed to accept is the fact that Nigeria only exists by imagination. It's time we face the giant destroying our future ( in the state you claim we are one ) by finding the solution to the mathematics problem called Nigeria. The Military proscription of IPOB as a terrorist organisation means proscribing the entire Biafra land as a terrorist region because IPOB simply means indigenous people of Biafra. Common sense should have told the so-called Eastern governors that IPOB is real people, a real nation comparable to both Arewa and Oduduwa . Can any man proscribe the existence of Arewa or Oduduwa?These are some of the questions these hungry governors owe the answers to posterity, who for sure would find it most compelling to reward them in the most agonizing way without tampering justice with the least of mercy because accepting that IPOB is a terrorist group apparently tantamount to accepting the total annihilation of the nation of Biafra. These governors proscribed their own existence as a people, in the name of seeking national security without recourse to the unguided activities of herdsmen in virtually all parts of the country with many casualties and fatalities, which have undermined the fundamental rights entrenched in the constitution of the said Nigeria and even the constitution in its entirety. 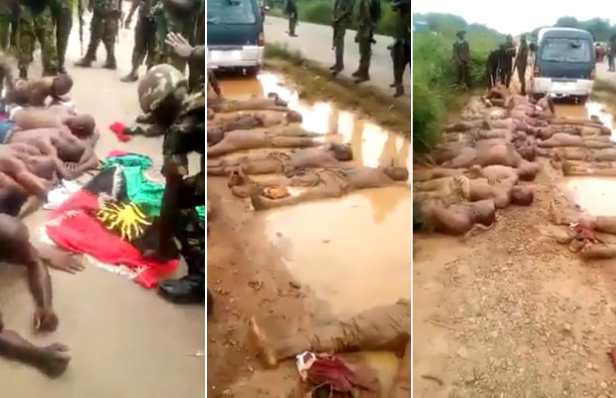 It is likely that the Nigerian government via the military has more in stock for IPOB and her sympathisers: to declare a state of emergency in Abia State or even the entire Southeast before they move over to the South-south to complete their tasks. This is succinctly captured. It is my advice that the military should with point of reference of future circumstances wherever to redefine and refine its rules of engagement to meet UN and national standards in peace and security issues, and not undermining the fundamental rights of civilised and peace-loving people as found in the IPOB by both the country's judiciary and the outside observers. It is advisable for those in the military to always remember that the service lasts only for 35 years after which comes judgement of the innocent blood of men, women and children you forced to their early grave and including the ones you deny thereafter. Keep wondering why the Indigenous peoples of Biafra are into this kind of association where the disconnect between those who lead and the led is a fatal one. Public office is personalised and for selfish interest. Those in position of leadership forget that whatever a man sows, he reaps. They sow aggression through frustration acts on the led and that is exactly the precursor to where the "Nigeria " is today.